Want to know how a top athlete tackles different terrains? UAE ultramarathoner Tori Leckie of www.fitchicksandfastwomen.com reveals some of the techniques she used during the 50km Dodo Trail in Mauritius. Hitting the tarmac is tough enough, but how do you cope when you’ve got steep ascents, descents, sand, and hours of darkness thrown at you? Ultramarathoner Tori Leckie faced all of these challenges when she took part in the 50k Xtreme Dodo on 7 July. “I have never seen such technical terrain,” says Tori. But if you copy her tips you could also be taking this race in your stride. Now You Do It: Shorten your stride and just focus on getting a good rhythm. It’s far better to move constantly and slowly than fast with too many stops. Swing your arms more and shift your body to lean into the hill. Stair climbing in skyscrapers is brilliant training. I Did It: Unlike my strength on the ascents, my descents are poor. There’s no substitute for training on real downhills and in Dubai we don’t have this option. I find others just floating past me while I battle with a constant fear of falling. Now You Do It: People often mistake running downhill for being easy, but it requires your muscles to lengthen, which results in many more tears in your muscle fibres. Shorten your stride, focus on quicker leg turnover and trust a good pair of trail shoes to provide enough grip – it should feel like controlled falling. I Did It: Training in the UAE, I’m pretty strong on sand and love the soft landing. While running on sand requires great physical effort, it’s much kinder to your joints and far easier on your body. Now You Do It: When training, focus on strengthening your core and working on your balance as this will pay dividends for the soft, uneven terrain. Think Swiss balls, BOSU balls, yoga and Pilates. I Did It: Generally, I thrive in the heat, but on the Dodo Trail I underestimated the heat and the effort I was putting in, and I ended up drinking too much water without taking in enough electrolytes. This left me with terrible cramping. Now You Do It: Never skimp on water supplies to reduce the load in your pack and take electrolytes throughout. Most people like to use bladders so they can sip constantly without having to stop. Wear sunglasses and a visor and when opportunity permits, cool down with water on your neck and head. And wear sunscreen. If doing a race in the heat without training in the same climate, extended sauna stints come highly recommended. Now You Do It: Running with a head torch adds extra challenge as your visibility is very restricted so it is recommended you train at night. Batteries run low very quickly so never start a race without new ones or without extras in your pack. 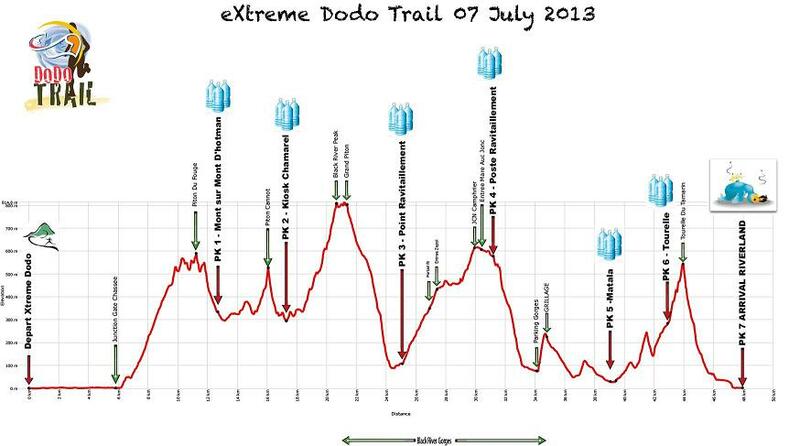 The Dodo Trail is the greatest race on the Mauritius running calendar. It has three distances – Xtreme Dodo (50km), Ti Dodo (25km) and Mini Dodo (10km). 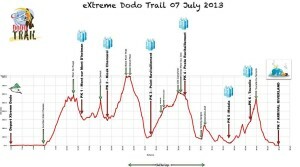 To learn more about the race, visit The Dodo Trail Race website – www.dodo-trail.com/en. Next year’s event is on the 13 July 2014. To book flights check out Air Mauritius and Emirates who both fly direct from Dubai.